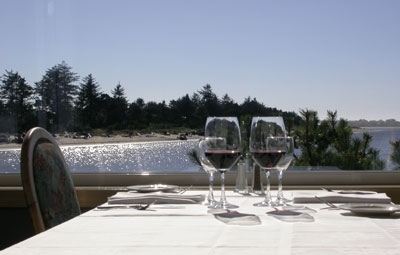 When visiting the Oregon Coast for a long weekend with my husband, my two young sons, and my adoptive mom, I avoided calling my birth-uncle on my birthmom's side, Steve, who lives in the same town we were visiting. Although I had planned to visit, had told them I was going to be in town, I avoided getting things set. Part of that is just me - my personality is to not nail anything down and, instead, play it by ear. Besides I'm awful about being in touch (to birthdad John - if I still haven't talked to you by the time I post this, I'm really sorry, but know I've been thinking about you and have even put a trip out to you and Lark camp on the calendar for next year - really sorry). But another part of it is that even after all these years, it's still just weird to combine the worlds of my birthfamily and my adoptive family. This frustrates me, I should be used to it - this isn't a new thing. Yet, as accepting as everyone is, it's still uncomfortable for me. This trip helped me see why that is. “So, do you know who your REAL parents are?" "You would crush your parents, I am sure if you ever tried to find your “real” family." It's been a very long time since I posted here with Lost Daughters. It has been a time of illness and revelation, hard work and great peace. As you may know, here in Australia, we not only had a Federal Apology for the sufferings of forced adoption, but State Apologies as well. I am lucky enough to live in a State which took the Apology very seriously and made every effort to get it right, to set the right tone for the occasion and to ensure that the wording of the Apology reflected all that was and had been experienced by Adoptees as well as mothers. For the first time Adoptees were recognised, validated and the inhumanity of adoption understood. It was a landmark for us all, no matter where we live or were adopted. It set a precedent and has shown that Governments can show understanding, compassion and be willing to accept the wrong-doing of those who carried out adoptions so long ago. It gave hope to many and I hope it will continue to do so, as we proceed down the difficult road of adoption reform. I only became aware of the Adoptee Rights Coalition (ARC) and their annual demonstration last year, and by the time I did, it was too late to plan a trip to Chicago. This year, I was ready—and lucky, because this year the National Conference of State Legislators (NCSL) was held in Atlanta, where I live. 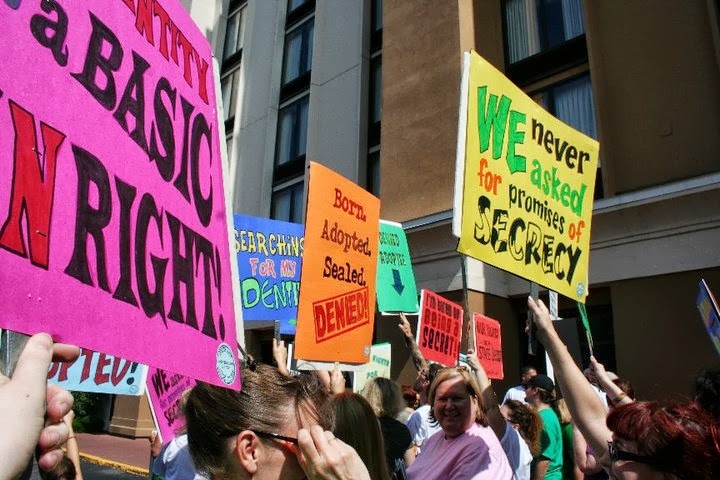 Each year for the past six years, the Adoptee Rights Coalition has organized a demonstration outside the NCSL in order to raise public awareness of adoptee rights. 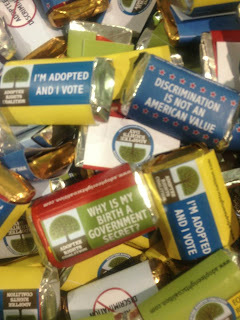 Inside the conference, the ARC sets up a booth where volunteer supporters speak to the visiting legislators about the laws in their home states pertaining to adoptees’ original birth certificates (OBCs). Currently, only six states allow adopted adults total, unrestricted access to their OBCs: Alaska, Kansas, Maine, New Hampshire, Oregon, and Alabama. In every other state, there is some kind of restriction in place on OBCs. These restrictions include allowing birth parents to veto access (as in Illinois and Washington), blackout years during which OBCs cannot be accessed (as in Ohio and Massachusetts), and complete sealing of all adoptee OBCs across the board in many states. I didn’t always know that so many adult adoptees cannot get a copy of their own, original birth certificate. I first became aware of the law in my home state of Ohio when I began the search for my birth mother (who I found without the aid of my OBC). And I’ve only recently begun to think of myself as an adoptee rights activist. 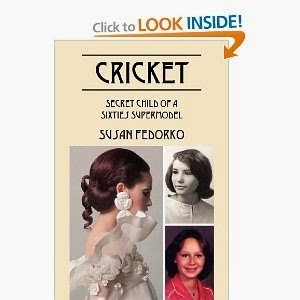 As newly Native American myself (as revealed through DNA), receiving Susan Fedorko’s book to review was perfect timing. As I began to be pulled into Susan’s life story, I realized other things we have in common – she was 40 when she first heard from her birth family, like myself. We both are 1960’s Baby Scoop Era adoptees who are related to a famous artist by birth. As I was reading Susan’s book, I felt as though I was sitting on the couch with her, coffee in hand, listening to her tell me her story. She writes in a style that feels like you are instantly her friend, whether you know it or not. This past Sunday, several of our contributors were invited by Emelie Jeffries, host of Voices of Our People on Two Worlds Indigenous Radio, to participate in a panel discussion on Veronica Brown (aka Baby Veronica). The archived recording of the show is now available on the WMNF site and will be accessible through Sunday, August 25. Click on the best format under "Listen Again," then fast forward to the second hour of the program to listen to Lost Daughters on Voices of Our People. Many thanks to Emelie and Two Worlds host Alvon Griffin for providing the opportunity for adult adoptees to speak about this significant adoption case. The show reached 73,000 people when it aired on Sunday! "For women who are pregnant, nursing, or who may become pregnant"
Lately, when I hear this phrase--in prescription drug commercials when they list the warnings and people who should not take the drugs--I can't help but feel struck by it. Probably because I'm in that wide-open, vague category of "women who may become pregnant." My husband and I don't plan to have kids for a while yet, but still--it could happen. A friend recently reminded me that women get their ovaries directly from their mothers. I wonder if my own pregnancy and delivery will be anything like my mother's was for me or for my brother. 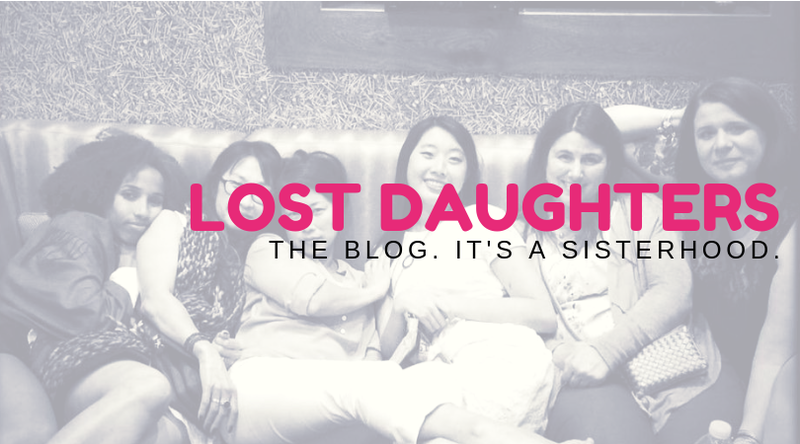 Thank you to the Lost Daughters sisters on here who write about their experiences becoming mothers; the gravity of this in relation to being adopted is becoming more real to me each day. The thought of sharing in common that life-changing, life-generating, physical experience makes me feel connected to my mother. We do not otherwise have a particularly close relationship, which I have made peace about. But there is gladness for me in the thought of connection to her in that way. I look forward to the chance to not only have a child but to raise it as well--in both of these acts I will join my two mothers. I will feel what they felt. I will be able to empathize, in a real way, with their experiences, and thereby know them better. If I can do half as well as those two women did with me, in birth and in nurture-- well, my child and me, we might just be all right. Lost Daughters contributors Trace DeMeyer, Samantha Franklin, Lynn Grubb, Deanna Shrodes, Julie Stromberg, and Karen Pickell will participate on a panel discussing the Veronica Brown situation on the radio show Voices of Our People, hosted by Emelie Jeffries. The show will air tonight, August 18, at 10:00 p.m. EST on Tampa community radio station WMNF 88.5 FM. Those outside the Tampa listening area can click on the "Listen Now" button at the top of the www.wmnf.org home page to hear the show. Joining our Lost Daughters will be author and Native American adoptee Susan Fedorko, and Professor Laura Briggs, chair of Women, Gender, and Sexuality Studies at the University of Massachusetts. Upon receiving this sheet disclosing my “non-identifying information”, for the first time I felt like I belonged to this world. I was bound to something and someone. I could look at my belly button and know that at one time there was another person to whom I was physically attached for however short of a period of time. It was physical evidence that I was at one time tethered to another person with whom I shared DNA. Every child learns of the story of the birds and the bees one way or another. So, as a very young child, my parents told me that I was “Adopted” I was “special”, chosen” and a “gift”. They would look into my eyes and tell me how very lucky they were to have my and to be my mom and dad. This made the word “adopted” take on special meaning for me though every adoptee is different, as with every adopted family the range of feelings any one of experiences is like spinning the big wheel on the Price is Right. This is a window into my life story as a closed adoption adoptee. What is it exactly? Well, it is the most mundane of things really. Something that few people ever give thought to for more than a cursory glance except when getting a driver’s license or passport. But for some of us, this is one document that confirms proof of my actual existence, not the legal fiction that was imposed upon me the day that my adoption was finalized on the 8th day of my life. We adoptee’s, those who were raised in a closed adoption are often cast into a legally imposed, permanent state of anonymous identity. At birth, our birth parents were given the option to sign our original birth certificates if they so desired. In my case, I got very lucky because my birthmother, knowing full well that there was the significant probability that she would never see me in her lifetime, placed her name on my original birth certificate. She was fortunate on that day to be given this advice by her attending nurse who said it would be the only way I might ever be able to one day find her. This one document, my original, non-amended birth certificate signed by my B-mom (as I like to refer to her) was immediately thereafter, signed, sealed and locked away permanently with the intention of being withheld from me regardless of my desire and or legal/civil rights to obtain it, for forever. I love and admire my adoptive mother. She is a smart, honest, and energetic woman who is a role model for me in many ways. She has nurtured and guided me throughout my life. She is accomplished in many other ways as well. But the one thing she did not do was give birth to me. So why does the primary legal document of my life say that she did? In the summer of 1966, my adoptive mother was still unable to conceive a child, though she later had an operation that made it possible for her to do so, resulting in the birth of my brother. On the day of my birth, according to a hand-written note now in my possession, my adoptive parents were visiting my adoptive grandparents, unaware that they were soon to become parents. And yet there are their names on my official birth certificate. I remember being confused when I learned about this as a child. My mother's explanation was that this was simply "the way things were" in adoption. For a long time I accepted that explanation and the situation. I accepted it until relatively recently, in fact. But I don't accept it any more. Adoptee Rights Week at Lost Daughters, OPEN THREAD: What Does your Original Birth Certificate Mean to you? 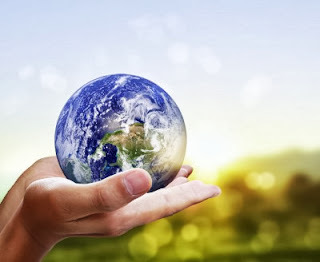 We talk about political and social issues a lot here at Lost Daughters which may leave people wondering where our project stands in terms of politics. We are a writing collaboration, founded on one really great principle: that the adoptee voice is necessary and should be heard. When our authors provide political or social commentary, they are representing themselves as individuals--although their views may resonate with other authors and our readers as well. Doing this, we've become a supportive environment to our women authors and hope that our readers are benefiting from our voices too. That said, we do discuss policy and politics a lot here. And although we're not a political organization, the topic of Adoptee Rights speaks to most of our authors and a large portion of our readership. In short, we'd like to spend time focusing on this topic this week. 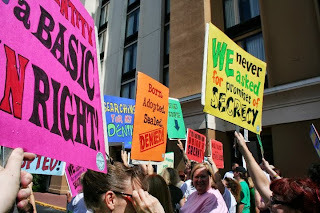 This could not be more timely as the 6th annual Adoptee Rights Day is tomorrow, August 12, 2013, corresponding with the 6th annual Adoptee Rights Demonstration. So we open this thread today--this week--to our readers to comment: what does your original birth certificate mean to you? If you are an ally to the cause who is not adopted, what does it mean to you to support changing the laws in most U.S. states to give adoptees the same access to their OBC that everyone else who is not adopted enjoys? I have recently engaged in some discussion and debate surrounding the Baby Veronica case. 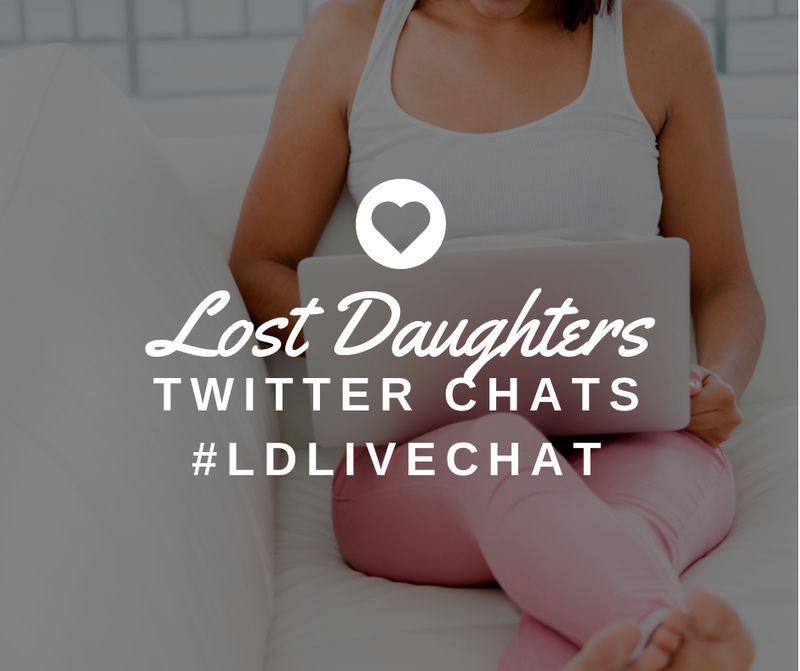 Right here on Lost Daughters, several of us expressed our thoughts on the case as adult adopted women. The fact that we are all adult adopted women here gives our points of view a solid base of actual experience from which to form opinions. As is often so typical when adult adoptees dare to raise questions regarding the ethics of the adoption industry from a legal standpoint, a few folks felt the need to comment on our Baby Veronica round table discussion. As is also so often typical, some of those folks resorted to accusations, generalizations and stereotyping of adult adoptees instead of acknowledging the points we made and furthering the discussion in a productive way. I personally made some observations about the legal impact this adoption would have on Veronica as an individual, adopted person. A commenter responded by informing me that my "(apparently) unhappy adoption experience does not translate into every child's experience." This commenter chose to address the points I made regarding Veronica's legal rights, and the impact of adoption's legal process on her, by making conclusions about me personally. I always find this sort of thing interesting because the legal aspects of adoption directly impact all adoptees--every single one of us. Our individual, personal experiences (about which this commenter knows absolutely nothing) have nothing to do with how all adoptees are treated from a legal perspective. That said, I would like to utilize the voice that I have here at Lost Daughters to once again shine the spotlight on what adoption does to adopted persons from a legal perspective. These facts directly impact Veronica Brown now that South Carolina has finalized the adoption. So her case serves as a timely example. I have seen many comments, here at Lost Daughters and elsewhere online, in which the people posting seem to feel that at least Veronica will be in an open adoption. These commenters seem to believe that this automatically guarantees that Veronica will maintain contact with her natural family members. 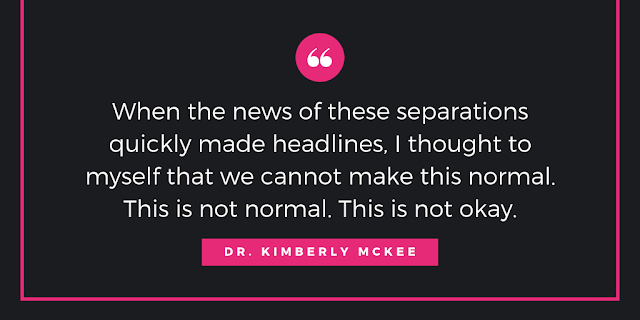 The truth is that open adoption agreements are not legally enforceable in Oklahoma or South Carolina. The adoptive parents in this case might be offering continued contact now while the press is watching. But they are not legally bound to uphold any promises made. They can decide at any time, and at their discretion, to cease contact with any member of Veronica natural families and there would be no legal repercussion. What this means is that adoption does not grant Veronica, as an individual, the legal right to continued contact with her own family. Like all domestic adoptees, Veronica will be issued an amended birth certificate stating the adoptive parents are her biological parents. This will be the only version of her birth certificate that she can legally use. The original will be sealed away and Veronica will not have access to it, even in adulthood. Neither Oklahoma nor South Carolina currently grants adoptees the ability to even view their original factual birth certificates. As such, Veronica will forever be forced to legally pretend she is the biological offspring of the adoptive parents. What this means is that all legal ties to her Cherokee background will also be severed through adoption. Which also means that all legal ties to her descendant's Cherokee background will also be severed because of her adoption. This is what adoption legally does to adopted persons. Legally, we are never considered an individual party to our own adoptions. And the rules don't change once we reach adulthood. We are forever bound by legally falsified documents and agreements made when we were children. These legal aspects of adoption have nothing to do with the personal experiences of each individual adoptee. All adopted persons--those from foster care, those from stepparent relationships, those from private agencies--are subject to these legal rules that result in us being treated differently than all non-adopted persons. All adopted persons. Every single one. Veronica included. 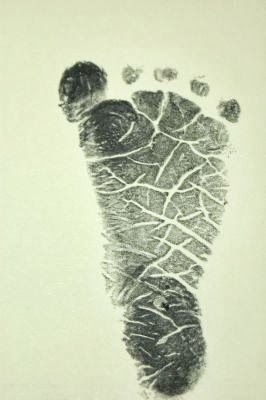 That said, all I ask now is for adults who comment only on how Dusten Brown didn't support his child while she was in utero; how Christy Maldonado had no right to keep a child from her father; or how Matt and Melanie Capobianco are selfish--please stop for one moment and consider Veronica, the innocent child involved in all of this adult infighting. Think about what her legal rights should be as an adopted person and then ask yourself if the current adoption system actually provides her with those rights as an individual citizen.